A teenager from Lambert, Stirlingshire, is urging people to get in the team spirit by taking on Make Today Count, Muscular Dystrophy UK’s sky diving challenge. Seventeen-year-old Tamsin Paterson is taking to the sky’s for the second year in a row, after plunging 10,000 feet in February this year. She’s got the sky diving bug, and has convinced her mum Lesley, and two friends, to join her in St Andrew’s next year. Together, they have formed a team called ‘Fallen Angels’. Muscular Dystrophy UK is a cause close to Tamsin’s heart, as her friend, Arryn Widd, 16, has Duchenne muscular dystrophy. This is a life-limiting condition which causes muscles to weaken and waste over time, leading to increasing and severe disability. “I met Arryn two years ago, when I started volunteering at the local Boccia club. He is such a great lad, and I wanted to do whatever I could to raise money to help find a cure for his condition. “I was pretty terrified when I did my first skydive, but I am really excited about next year’s. My mum and her friends are always up for a challenge, so it wasn’t too difficult to convince them to join me! “It’s great that Tamsin has recruited her mum and two friends to take on Make Today Count, making it a real team effort. Taking on a skydive can be quite a daunting prospect, but doing it with friends and family can ease the pressure, and make the day even more fun. Every penny raised by our parachuting team will be donated to our Duchenne Research Breakthrough Fund, helping scientists find potential treatments for the condition that affects 2,500 people in the UK. 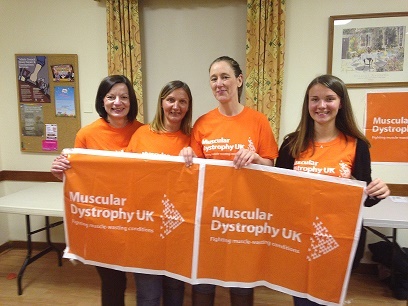 Find out more about Make Today Count: www.musculardystrophyuk.org or phone Muscular Dystrophy UK’s fundraising hotline: 0845 872 8058.